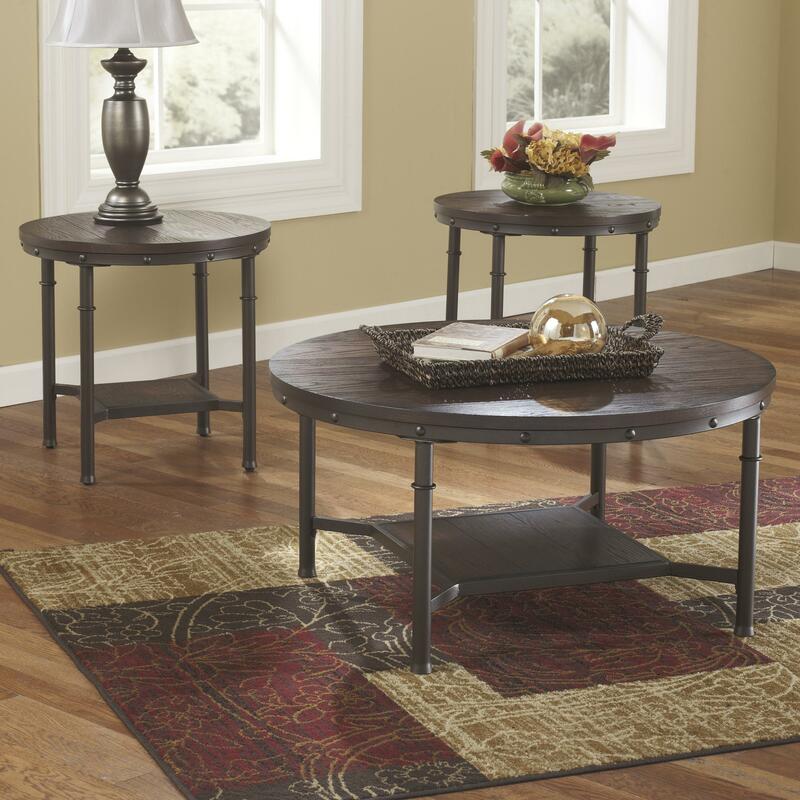 Cultivate a rustic look in your living room with this three-piece occasional table set. 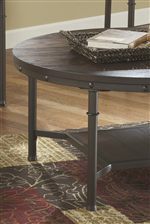 The round cocktail table and two round end tables feature welded tubular steel bases in a glaze accented powder coat finish adorned with nail head accents. Dark brown finish table tops with wire brushed grain create a vintage casual style for your decor. Each table includes a shelf in the base for added storage and display options. Cocktail Table: 38"W x 38"D x 19"H.
End Table: 24"W x 24"D x 23"H.
The Sandling Rustic Metal and Wood Veneer Occasional Table Set by Signature Design by Ashley at Michael's Furniture Warehouse in the San Fernando & Los Angeles area. Product availability may vary. Contact us for the most current availability on this product. Case Construction Table tops made with select veneer with wire brushed grain in a dark brown finish and made from welded tubular steel. Occasional tables feature nailhead accents and glaze accented powder coat finish. The Sandling collection incorporates exceptional metal work teamed with rich oak veneers and hardwood solids to make this distinct group a timeless classic. The Sandling collection introduces an occasional table set featuring unique welded tubular steel with twist and scroll details. Bathed in a dark bronze metal color, the sets exhibit dark brown finished table tops with a wire brush veneer treatment to give it a vintage style. The occasional table set, shown in a glaze accented powder coat finish, comes adorned with nail head accents and each table includes a storage shelf in the base. Creating a compilation that is sure to beautifully transform your home decor, the Sandling collection charms with its simple, inviting style to create a comfortable atmosphere in your home. The Sandling collection is a great option if you are looking for Casual furniture in the San Fernando & Los Angeles area.